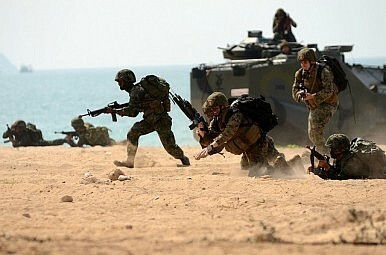 U.S. and Thai forces in Cobra Gold 2011. Thai and American military representatives are meeting this week at army headquarters in Bangkok to discuss the future of military cooperation between the two allies. The Executive Steering Group (ESG) meeting features mid-ranking officials and addresses bilateral military cooperation and joint activities in 2015 and 2016. This is the fourth annual ESG; the first was held in 2012. The talks are taking place amid uncertainty in the U.S.-Thai relationship. On the one hand, both sides have clearly been trying to mend ties strained following a coup last May, which forced Washington to suspend aid and cancel some exercises and exchanges (See: “Thai Junta Chief Blasts Top US Diplomat”). Thailand appointed a new ambassador to Washington in February, and the United States nominated one in April after a six month vacancy for the post (See: “US Nominates New Envoy to Thailand Amid Strained Ties”). Yet there are still lingering doubts about the strength of bilateral ties. The United States has yet to release its Trafficking in Persons (TIP) report, which Thailand hopes will upgrade it from the bottom tier it found itself in last year despite remaining rights concerns. On the security side, Thailand’s decision to purchase three submarines from China and deport 109 Uyghurs to Chinese authorities – which Washington firmly condemned – have fed into a broader concern that the country’s generals are moving too close to China (See: “How Did China Just Win Thailand’s New Submarine Bid?”). Bangkok’s subsequent announcement that it had placed a hold on the deal has only aroused even greater suspicion about what might be at work (See: “Is China’s New Submarine Deal with Thailand Now in Peril?”). But as I have stressed previously, despite these challenges, there is still a lot of quiet security cooperation between Asia’s two oldest allies that still goes on as usual. This is clear from the current ESG, which lasts from July 21 to July 24 and is co-chaired by Maj. Gen. Todd B McCaffrey, U.S. Army Pacific chief of staff, and Lt. Gen. Sermsak Niyamosot, deputy chief of staff of the Thai army. As the ESG meets to determine future military engagements, there are reportedly already 26 military activities scheduled for this year between the two sides. These include an already-concluded annual joint army exercise – Hanuman Guardian – the exchange of logistics and intelligence specialists, U.S. recommendations on provisions for aircraft, and cultural and linguistic exchanges. Despite all this, the limits of the military relationship in the current context are clear to all. McCaffrey told his Thai interlocutors that full military assistance and cooperation would be restored when Thailand holds an election under the junta’s reform roadmap. Polls, which have been repeatedly postponed, are now not expected until around September 2016 (See: “When Will Thailand Hold its Election?”). The meeting also predictably did not discuss military assistance to Thailand or weapons procurement of any kind, according to The Nation. Meanwhile, Sermsak said that preparations by the two countries for next year’s Cobra Gold – the Asia-Pacific’s largest annual multinational military exercise – were proceeding as usual. As I have reported previously, the United States decided to scale down this year’s Cobra Gold due to rights concerns that clouded specifics days before the exercises began (See: “US-Thailand Relations and Cobra Gold 2015: What’s Really Going On?”). Indications are that that Cobra Gold will proceed next year but will be scaled down as well (See: “US Will Hold 2016 Cobra Gold Military Exercises in Thailand”).